No zip code needed for this one! Immediately my son – never one to stay out of a conversation for long – and obviously having had some time now to process all this – spoke up. “No – here’s what we need to do,” he said in his authoritative tone, sounding well past his 9 years of age. “You put a box by the front door, and then Santa can just leave the presents there and we get them when we get back.” From the look on my Little One’s face, I could tell this was hardly acceptable. “You mean we don’t get to open presents from Santa on Christmas?” I could tell this festive 2-week trip to New York and surrounding areas was sounding less and less enjoyable. I needed to do something quick. “You could always write a letter to Santa, telling him that you’ll be somewhere else this year. I’m sure this happens all the time.” I said in my reassuring motherly voice. “If you give him enough notice, I’m sure he’ll be able to adjust.” Before you could lay a finger aside of your nose, they were gone. Running up the stairs as fast as they could to the computer where my son once again took charge. As I finished making dinner, they worked away. 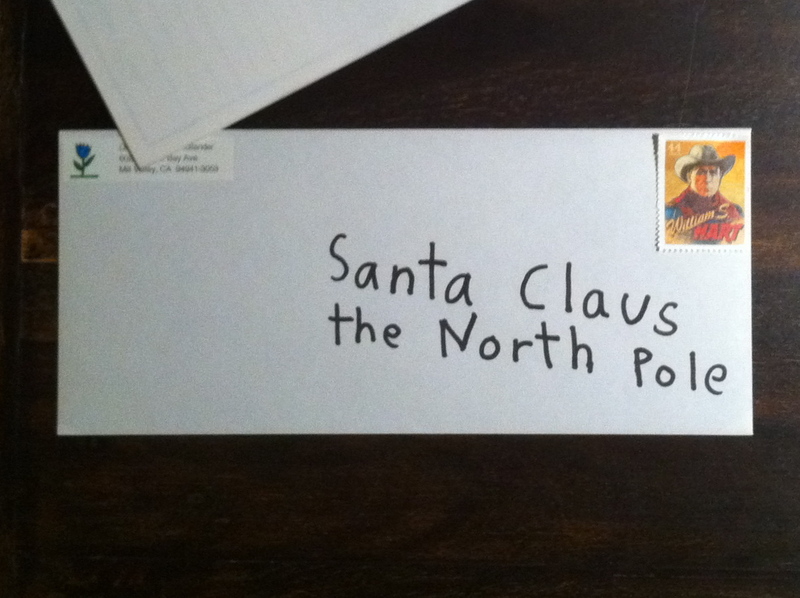 By the time my husband walked in the door, they had the letter printed and stuffed in an envelope, ready to be addressed to dear Santa. Luckily they printed an extra copy by mistake – a keeper as far as this Zen Mama Wannabe is concerned. If you deliver to the address above in Pennsylvania for us, it will make our Christmas so much better, so we’ll be able to open our presents on Dec. 25, like most kids. P.S. It’s more fun to open presents on Dec. 25, than any other day!!!!!!!!! Excuse me??! Now it was my turn to glare. “Christmas is a magical time. And it is an especially magical time when you are a kid. The world closes in on you fast enough. Especially today’s world. Why not keep the magic alive as long as possible? !” This is one topic you don’t want to get me started on. I say let kids be kids for as long as possible! My Little One beamed up at him, “Oh THANK YOU, Daddy!” as she ran to show her brother the final result. I glanced back at my husband. Darned if he wasn’t glowing a bit too. Yes, there is magic all around us – and it’s amazing how infectious it can be. What you do with that magic is of course up to you. But I say, it never hurts to keep it alive as long as you possibly can. You’re darn tootin’ right you keep that magic alive as long as you can!!! Especially since once the cat is out of the bag for the older one, it’s really hard to keep the magic alive for the younger one. And I agree with your Little One: presents from Santa Claus need to be delivered on Christmas morning. The ones from other relatives can wait until you’re home — that’s the wonderful thing about having 12 days of Christmas, after all. But Santa’s pretty much have to be there on Christmas morning. Oh but the cat’s not out of the bag for the older one….he still believes too! That’s the magic! He may be the last of his age group – but who cares?! The magic is still alive and well here. Great blog Zen Mama! I remember when my parents told me….and I was in shock! I was probably 10. End of the magical part of childhood for me. Kind of sad!! Believe as long as possible!!! When did 9 years old seem to old to believe?! The last in his age group to believe…I hope not! My oldest was devestated by the “news”, which we told her only after she insisted on knowing. My youngest is 12 yrs. old and still has never officially asked. I am sure she “knows” but you can see that she loves keeping the magic going too.